It’s been on my to-do list for a while now. I’ve wanted to write a little series of posts on different rooms within the home, and how to get the best out of them. So, I’m kicking off with the living room. Now, I’m not an interior stylist or designer and don’t claim to be. I have a certain style and I research (a lot) in magazines and online so much of what I pull together is based on my own likes and dislikes. I’m not telling you this is exactly how it should be, but hope to give practical, family friendly ideas that are inspirational and stylish, that you could easily incorporate into your own home. 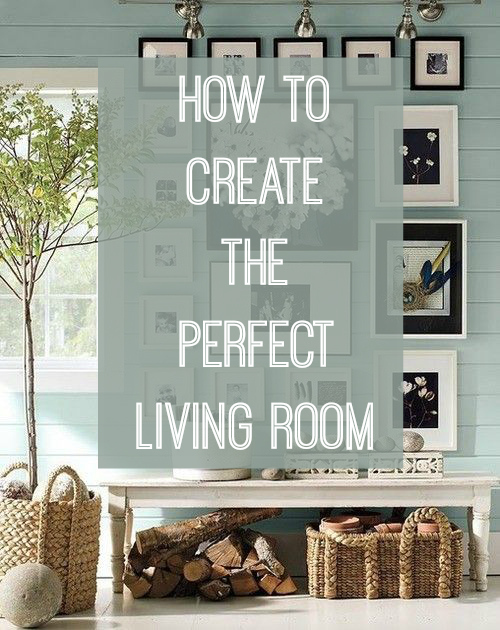 So let’s begin on how to create the perfect living room. Before you begin, take some time to find the look you want to create. You might want to try something new, or tie it in to the rest of the house. Whatever look you go for do your research. Take cuttings from magazines, create a Pinterest board, or even pull your favourite items together in a moodboard on something like Houzz or Polyvore. I have a tutorial on how to create a Polyvore Moodboard here if you need it. This will help prevent any costly design errors or choices, and keep you on track whilst you’re shopping. This part isn’t always easy but think about how to accommodate all of the family, particularly the young people, when designing your room. Give them their own seating; beanbags or little chairs are great, and ensure they feel part of the family. Ensuring fabrics and materials are washable or wipe clean will help keep the room looking good too. Have tables at the right height for play, and avoid sharp edges. Keep breakables out of reach for young children too. Go for stain-proof carpets, and fill your living room with comfortable seating and lots of books. You can do this in several ways. If you have large windows allow as much light to flood into the room as possible, but if you aren’t blessed with such features, you need to trick the space into feeling lighter. Use light reflecting paints, gloss surfaces or glass and perspex furniture. Remember to add a mirror, opposite the window if you can to help bounce light around the room. And if you can remove a door, or create a walkway through to the next room this will also help. Don’t forget to add lighting to your design too. Accent lighting, task lighting and table lamps all help to create an atmosphere in the room, and keep it cosy and welcoming. Harsh lighting will make the space feel uninviting and cold so try to avoid too many overhead lights. I’ve talked about creating a focal point on the blog before, and a living room benefits greatly from this. Often it’s a fireplace, but if you don’t have one, it might be the window, or the sofa or even a light fitting from the ceiling. 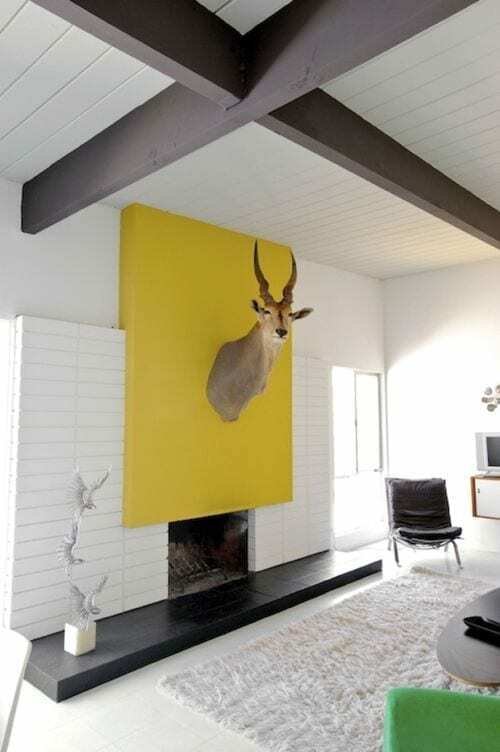 You might not want a huge stag head above, but create the wow factor with one piece, that draws the eye into the room, and helps to set the tone for the rest of the decor. It will really give your living room some focus, and can be great help in designing the remainder of the space. It goes without saying that a great living room design needs comfortable seating. When you have a young family you don’t always want to spend huge amounts of money on this, knowing it might get wrecked in a few years. I’m a big fan of the high street for these pieces; take a look at the range of sofas from Argos for example, and seek out some stylish items at very reasonable prices. You might also like to take a look at my definitive shopping guide. It’s a great resource of inspiring, on trend and affordable stores where I like to shop in order to create my own home. You can get the Love Chic Living Shopping Guide HERE. I talk about this a lot, but a well designed family home needs plenty of great storage, and the living room is no exception. There are lots of ways to incorporate storage into the room. Think about shelving for books and accessories, coffee tables with drawers, or even pouffes with hidden storage like these here. Be creative with your storage, upcycling old pieces of furniture and giving them new leases of life. Fill your living room with family photographs and memories in the collections you have on display. Fresh flowers, and somewhere to rest a glass of wine are essential too. Above all of this, ensure the space reflects your personality, and the likes of your family. Add plenty of touches that showcase your lives, whether that’s with photos, books or Grandma’s silver collection. Make the space personal and it will, in turn be welcoming and warm. A wonderful family living room. What do you think makes the perfect family living room? Would you add anything else? And don’t forget to get your hands on my awesome shopping guide, packed full of exactly the right shops to explore when you’re creating your perfect living room. Great post, totally agree with your points. Living rooms need to be homely, welcoming, relaxing and with a touch of style (and of course comfy). Great lighting is crucial in any room, choose a central/main light and then add lamps to add mood lighting. Definitely am a fan of mirrors, they are beautiful features and do add extra light. Focal points are very important to tie a look together. Don’t necessarily have everything too matchy, having a few contrasting pieces like a feature chair of unit can add layers to a space and allow styles to really stand out. Wow! I have the perfect living room and didnt even know it! However, I disagree about using family photos in common areas. I’ve always been taught that they are better left in a hallway gallery or a bedroom. I love my family photos they make me happy I want them every where (tastefully arranged) . I think go with what you love surround yourself with things that make you smile. no rules make your own style. love all of the ideas. Hey Jen, this is Glenn from epic home ideas. I love the design suggestions you are presenting here on this blog. Yeah having a focal point in the living room is really important ( I love the picture you have for the focal point in your article). Another important aspect of living rooms is flooring. I love hardwood floors since they create a cozy atmosphere in the whole house. Love the points that are discussed here. Cant believe that the freshness of this article in the light of changing interiors.